Our hilltop wine tasting room opened in 2008 and was named Lloyd's Lookout in honor of Lloyd Messer, the winery's visionary cofounder. Come enjoy our award-winning wines while taking in breathtaking 180-degree views. With glass walls, the Tasting Room serves as a fitting showcase for both the lush wines and the beautiful setting. Click here to take a 360 degree tour of our Tasting Room. Wine Tasting is available every day from 10 - 5. General tasting fee is $15 per person for a flight of 4-5 wines. Groups are welcome, and reservations are appreciated. Our gift shop features logo gifts, clothes, books, and wine accessories. 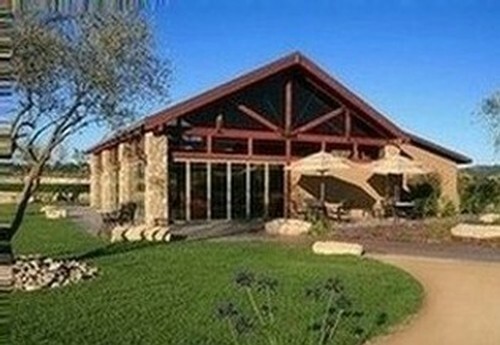 Private Winery Tours & Wine Tasting are available daily. Reservations are required. CLICK HERE for more information. And don't forget, on Saturday and Sunday you can enjoy a Food and Wine Pairings lunch available for purchase from 12-3pm! We've partnered with local restaurant, Thomas Hill Organics, for a fresh, local, organic menu paired with our award-winning wines. No reservations needed. Holiday Hours: Calcareous will be closed for Easter Sunday, Thanksgiving Day, Christmas Day and New Year's Day. Please Note: The above information is subject to change due to Wine Club parties, holiday weekends or festival weekends. Please visit our Events Calendar for more information.